Mumbai, June 2013: Have you been succumbing to the ties of hair bands and ponytails, especially when you want to let your hair down and enjoy? Is dandruff the main bane of your life? 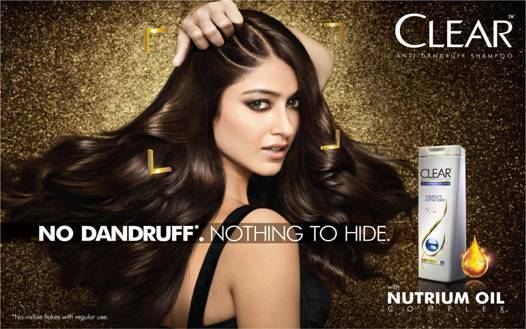 Banish your hair woes with the new CLEAR anti-dandruff shampoo with unique Nutrium Oil complex. New Clear with Nutrium Oil complex has a ground breaking dual gender scalp nourishment formula for Dandruff free*, healthy hair. Bringing in a new epoch in hair care, CLEAR is reinventing itself with its new campaign, “Nothing to Hide, Lots to show” which is about having complete confidence in you. New CLEAR with Nutrium oil complex, a ground breaking dual gender scalp nourishment formula gives you the chance to have Dandruff free* hair that feels well nourished and helps to keep your head held high. With the combined benefits of pro-vitamin, minerals and sunflower oil; Clear with Nutrium oil complex fight dandruff at the root and nourishes the scalp** to help eliminate flakes, soothen dryness and repair the scalp** barrier by strengthening its natural resistance. CLEAR helps you to maintain a well-nourished scalp for beautiful strong hair. Developed by the experts at the CLEAR Paris Institute, this unique technology has been endorsed and recognized by International Academy of Dermatology (IACD). one of the leading scalp care shampoo. touching the lives of two out of three Indians. HUL works to create a better future every day. good for them and good for others. Have a nice start to the week! I am always eager to try new shampoos...thanks ! packaging is so nice, Thanx for the info Rads! Hi, Pooja how are you doing?